The rise of Comic-Con has given birth to an unprecedented surge in superhero movies, slavishly tailored to flatter the egos and stoke the libidos of 14-year-old boys and their adult emotional equivalents. But while the po-faced seriousness of Zack Snyder’s Watchmen and the Dark Knight movies may be an advance from the days when every article about comics started with the words “Bam! Pow!”, they’re still products of a time when comics were struggling to be taken seriously. The midnight hues and over-the-top violence made Frank Miller’s The Dark Knight Returns a superhero book—sorry, graphic novel—adults could read without feeling ashamed. But now that grittiness is the law of the land, the idea of setting costumed crusaders in a realistic milieu has become just another adolescent fantasy. James Gunn, who is currently directing the big-screen version of Marvel’s Guardians Of The Galaxy, gets comics in a way few directors this side of Sam Raimi and Joss Whedon do. He loves the allure of spandexed, slogan-spouting crime fighters, and of moral combats that play out on an intergalactic stage. And he understands, at heart, that this stuff is kind of ridiculous, which only makes him love it more. 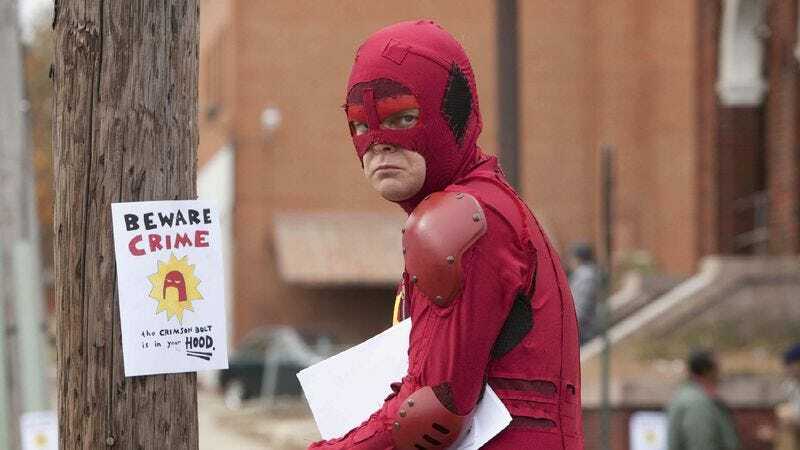 The man who will become the Crimson Bolt, the pipe-toting vigilante of Gunn’s Super, is Rainn Wilson’s glum short-order cook, a dim-witted lug whose life is highlighted by the moment he pointed out a fleeing shoplifter to a nearby cop. When his ex-junkie wife (Liv Tyler) falls under the sway of Kevin Bacon’s swaggering dealer, Wilson slips on the tights and starts fighting crime. A little rusty on the fundamentals, he stops by a comic-book store for research, and leaves with a rabidly eager sidekick played by Ellen Page, who promptly christens herself Boltie. Although he’s not much in the crime-stopping department, Wilson becomes intoxicated by his own delusions of power, so much so that he starts punishing minor acts of civic disorder with a swift plumber’s wrench to the skull. Page takes it even further. She doesn’t just love violently dealing out justice—she gets off on it. Page ineptly demonstrates her purported martial-arts prowess to hilarious effect, but put a sharp object in her hand and she starts to do real damage. Gunn saves his masterstrokes for Super’s final act, abruptly swerving into blood territory and then pulling back for a moving, even spiritual coda. The film was shot on a tiny budget, and it shows, but its ideas are worth more than money can buy. Availability: DVD and Blu-ray, digital purchase from iTunes and Google Play, and disc rental from Netflix.